It goes without saying that New York City is filled with a wealth of iconic attractions and landmarks to see and visit. Despite its reputation for being a very expensive city, New York City in fact offers many attractions and sites that don’t cost visitors a dime. Located all throughout the city, these attractions are great for those on a budget or anyone looking to take in the city’s vibrant culture and renowned landmarks. Central Park boasts 843 acres of serene greenery, lakes, ponds, walkways and nature trails. Best of all, its completely free to guests. 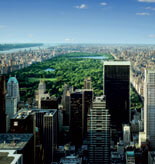 A must-see attraction and the launching point of many tours of the city, Central Park can’t be missed. The perfect place to relax and unwind, the park offers free tours as well as a plethora of recreational and leisure opportunities. Those visiting New York City will find no better place to sit down, relax and enjoy this famous green oasis in the middle of Manhattan. The Staten Island Ferry runs between Lower Manhattan and the borough of Staten Island. Completely free of charge, it offers phenomenal views of the city’s harbor, the skyline, Ellis Island and the iconic Statue of Liberty. Those looking for an unforgettable view of New York City will find that the Staten Island Ferry is the place to be. Built in 1879, St. Patrick’s Cathedral is one of the most beautiful Catholic cathedrals in the United States. Free to visit, it boasts stunning Gothic architecture and a gorgeously decorated interior. Its serene atmosphere makes it a great place to come relax and gather one’s thoughts. A visit to this magnificent cathedral should be on top of the itinerary for anyone visiting New York City. The cultural heart and soul of New York City, Rockefeller Center has served as America’s public square since the Great Depression. Boasting astounding Art Deco architecture and design, Rockefeller Center is always overflowing with activities and events. One of the best times to visit is the holiday season to see the center’s iconic Christmas tree and skate in its ice skating rink. One of the most iconic and celebrated tourist attractions in the world, Times Square pulses with energy 24/7. The home of the country’s biggest New Years Eve bash is also completely free to visit. For a truly memorable experience, head to Times Square at night to see its famed neon lights and flashing signs the best.